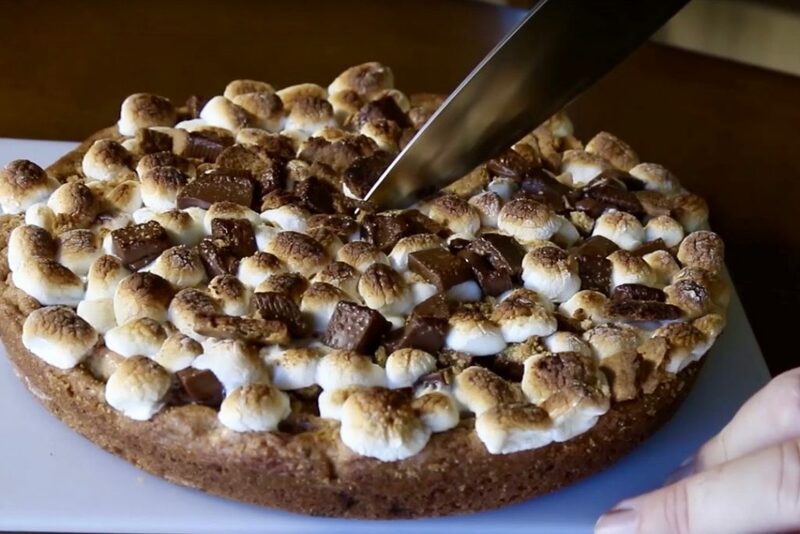 Home » All Posts » Giant S’mores Chocolate Chip Cookie. Giant S’mores Chocolate Chip Cookie. This series is ‘Tuesday ChooseDay’ where I want you – the viewers – to help me decide what I am going to make. Tell me below, or on any social media, what you think would be cool or fun to make and if it generates enough excitement or I think it’s a good idea it may appear in a future episode of ‘Tuesday ChooseDay’. So join in the fun and tell me what you think I should make. Into a large mixing bowl add the granulated sugar, brown sugar and softened butter. Cream together until fluffy. Add the vanilla extract and the egg. Beat together to form a smooth batter. Add the flour, baking soda and salt Mix together until combined. Toss in the chocolate chips or chunks and stir through. Spoon into a 9 inch baking tin, flatten and smooth the top. Place in the oven for 15-20 minutes until golden brown. Remove from the oven and sprinkle some of the crumbled graham crackers on top. Add most of the chocolate chips. Liberally cover with the mini marshmallows. Now sprinkle on the rest of the graham crackers and the chocolate chips. Place back in the oven or under the grill just to melt the chocolate and lightly brown the marshmallows. Remove from the tin, cut into slices and serve. Yum Yum! !